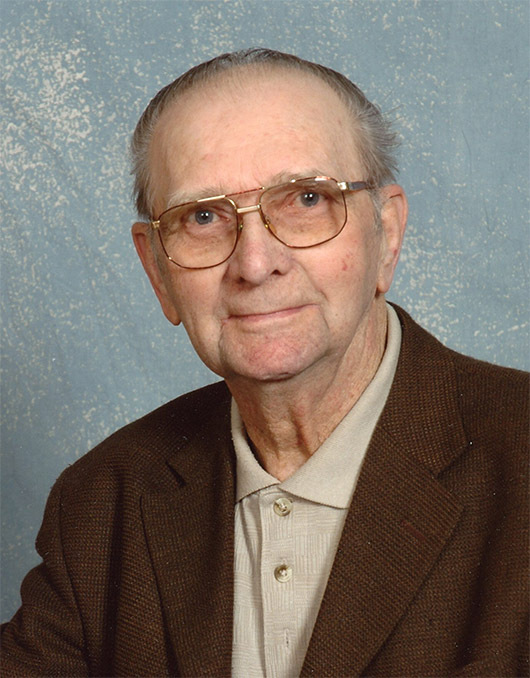 Jacob Giesbrecht of Halbstadt, passed away peacefully at the age of 101 in the Altona Community Memorial Health Center. He will be missed by his sons Glenn Giesbrecht (Lesley) and James (Eva Reimer) Giesbrecht, grandchildren Tammy (Giesbrecht) Crosby, Jamie (Giesbrecht) Poole , Jodie (Giesbrecht) Majchor, Robert & Jenn Giesbrecht, Laura Giesbrecht, Sarah Giesbrecht, Peter Reimer (Giesbrecht), Andrew & Justina Reimer (Giesbrecht), 13 Great Grandchildren and numerous nieces and nephews. Jacob was pre-deceased by his Parents Peter and Susanna (Krahn) Giesbrecht, wife Tina Giesbrecht, son Wesley and 7 brothers and 2 sisters; and survived by one sister-in-law Margaret Klassen. Jacob was born in Gruenthal near Altona. Jacob early in his married life moved to Halbstadt in the mid 1940’s. It was in Halbstadt where he chose to settle his roots to begin his farming life with Tina. He lived and worked his farm until he celebrated his 80th birthday when he then decided to retire from farming. After this he moved to Altona where he spent his time and days visiting and caring for Tina until her passing in April of 2001. Being as independent as he was, he continued to live in the Elmwood apartments until he was 97 years of age. Then he took up residence in the Ebenezer Manor until he became ill in the summer of 2018 and was hospitalized in the Altona Memorial Health Center. Jacob had a very strong love for and faith in the Lord and was a member of the Altona Sommerfeld Mennonite Church where was an active member during his life. Generous and kind in spirit and devoted to his faith he loved his family, church and community. He loved to farm and always made sure that he paid attention to the details of what he grew in livestock or grains. Jacob was lovingly surrounded and cared for by family during his last days. The Family would like to express their deep gratitude for the Doctors and staff at the Altona Memorial Health Center for their compassionate care of Jacob and unconditional support of his family during this time. Funeral service was held on Saturday, December 15, 2018 at 2:00 p.m. at the Altona Sommerfeld Mennonite Church, with burial at the Altona Cemetery. Donations in memory of Jacob P. Giesbrecht may be made to the Canadian Diabetes Association.